asus.com / ASUSTeK Computer Inc.
ASUS no longer produces the X54C laptop models anymore but they continue produce similar systems such as the X555LA which has many of the same basic characteristics but with newer internal components. If you are in the market for a low-cost laptop, be sure to check out our Best Laptops Under $500. Or, if you're specifically looking for an ASUS, be sure to read our Best ASUS Laptops to Buy Now for up-to-date options. Oct 16 2012 - ASUS does a very compelling job of making an affordable laptop with the ASUS X54C-RB93 that offers it performance typically found in laptops costing a good deal more. They even manage to add a USB 3.0 port which many at this price point lack. There are a number of compromises that the system makes including a smaller battery for shorter running times, less internal storage and just two overall USB ports. For many people, these compromises are probably not going to be a big concern, though. 14.9" x 10" x 1.5" @ 5.7 lbs. Oct 16, 2012 - ASUS tackles the most affordable range of traditional laptops with their X54C series of laptops. What sets the X54C-RB93 apart from most other systems in this price range is the general performance from the processor and memory. Rather than relying on a Pentium or AMD processor, it comes equipped with an Intel Core i3-2370M dual-core processor more typically associated with laptops priced between $500 and $600. The performance is also assisted by the 6GB of DDR3 memory that helps the processor tackle just about any computing task and certainly gives it an edge in this price range. 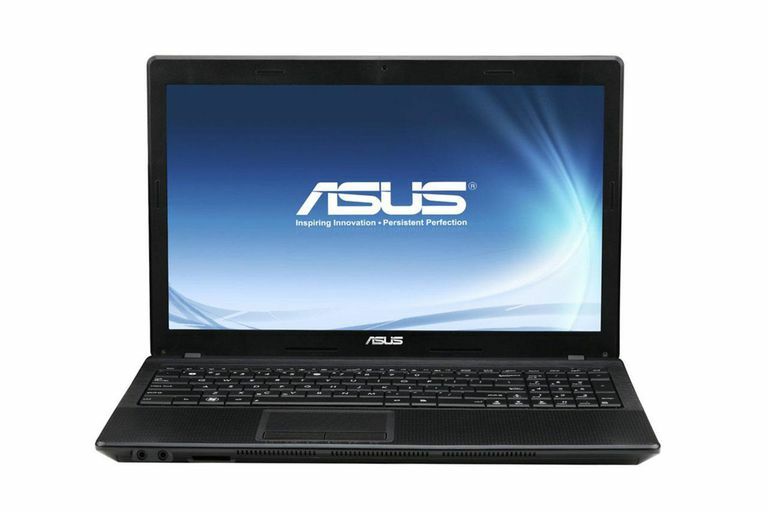 The low price of the ASUS X54C-RB93 is partially made by reducing the size of the storage in the laptop. While it isn't uncommon to find laptops that use a 320GB hard drive such as in this one, most systems now priced around $400 will come with a 500GB hard drive. This means that there is less space for applications, data and media files. To offset this, ASUS is one of the few companies that actually provides a USB 3.0 port in their least expensive laptops. This allows for easy expansion with high-speed external hard drives. While it does have USB 3.0, there are only two total ports, one USB 3.0 and one USB 2.0, on the laptop which is less than most the competition. A dual layer DVD burner is included for playback and recording of CD or DVD media. The display and graphics for the ASUS X54C is pretty much that standard fare for a budget class laptop these days. The display is your standard 15.6-inch display panel with a 1366x768 native resolution. It uses the low-cost TN technology which means that it has limited viewing angles and color but this isn't something many at this price point are too concerned with. The graphics are handled by the Intel HD Graphics 3000 that are built into the Core i3 processor. This is perfectly fine for the typical tasks most consumers have but it has very limited 3D performance making it unsuitable even for casual PC gaming. Those wanting to do that might be better served by the AMD APU based laptops at this price point. What the Intel graphics do offer though is improved media encoding speeds when using Quick Sync compatible applications. Rather than using the isolated keyboard design that ASUS uses in most of their systems, the X54C features a more traditional style that is raised from the keyboard deck. It doesn't have the same level of feel or accuracy as other ASUS laptop keyboards but it is functional. The biggest problem with this design is that it can easily get debris under the keys which can affect its overall functionality. At least the open design makes it fairly easy to clean. The trackpad is a decent size and slightly recessed within the palm rest area. It features dedicated right and left-hand buttons and works fairly well. Another way that ASUS has saved money on the X54C is with the battery. Many systems use a six-cell battery pack that is rated around 48WHr for capacity. ASUS has instead used a four cell battery pack with a much lower 37WHr capacity rating. In our digital video playback test, the laptop runs for just over two and three-quarter hours before going into standby mode. This is a good three-quarters to a full hour less than your average 15-inch laptop. It certainly falls well below of the HP Envy Sleekbook 6 with its near six-hour running time or Dell's Inspiron 15R at almost four hours but both cost around $600.